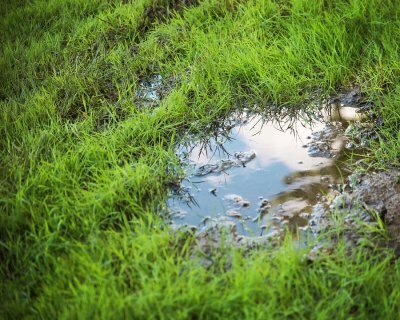 Have you noticed that your lawn is filled with puddles or even deep pools of water after it rains? If so, there’s a good chance that you have poor drainage on your property. This can lead to a series of problems, including the need for foundation repair. You should think about having waterproofing near San Antonio done so that water isn’t able to harm your home. You should also fix your drainage so that water doesn’t ruin your yard. Here is what you need to know about drainage issues. Drainage issues might be the result of compacted soil in your yard. When water pools on top of your yard as opposed to penetrating down through your soil, it’s often because the soil is very compacted. This will prevent the water from getting into it and, instead of being absorbed into the soil, rainwater will simply sit on top of it. Aerating your lawn is one way to try and stop drainage from becoming a problem. However, if you aerate your lawn and still have an issue, you may need to consider installing a drainage system that allows for your yard to drain water more effectively. Drainage issues can affect your home’s foundation. If water is pooling in your yard, you might think it’s not a big deal. After all, as long as it evaporates eventually, there’s no harm in having water in your yard, right? Wrong. If the water sits too close to your home and comes into contact with your foundation, it can actually seep into it and cause everything from cracks to mold. You will almost certainly need to hire a contractor to come and do foundation repair if you don’t fix your drainage. Drainage issues can be fixed in many different ways.